Saturday Surprises: The Mane Event! 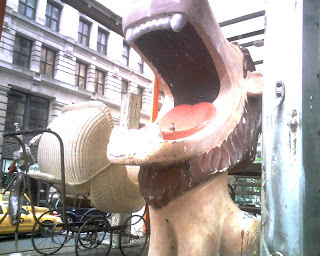 My mouth dropped as I was veering down Fifth Avenue the other day, for right there, in the middle of Manhattan, was a painted concrete lion drinking fountain standing guard aside a vintage baby pram. Did the lion eat the baby? Was the lion guarding the baby? Was there a baby lion in the pram? This outrageous sculpture reminded me of the ones that I believe used to be at the Kansas City Zoo in Swope Park. To get a sip of luke-warm water from its spout, you had to stick your head inside one of these beasts, which, I recall, also included a yawning hippo. I'll have to rummage around in my old family photos when I go home to Kansas City in a few days and see if there are photos from our childhood trips to the zoo. I also remember a gigantic whale with a carpeted tongue that squished under your feet as you entered its mouth. This fabulous feline was on the back of a flatbed truck promoting a New York vintage shop called Olde Good Things. I'll have to poke my head in there someday! 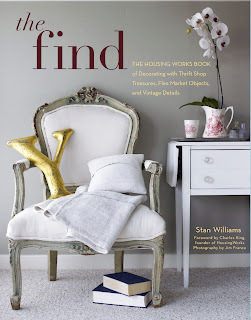 Stick your head into a copy of The Find: The Housing Works Book of Decorating with Thrift Shop Treasures, Flea Market Objects, and Vintage Detailsat Borders, Barnes & Noble, Amazon or Powell's. The Gift of Thrift: What a Dish! Whether it's an intimate dinner or a mega-big blowout (not the salon kind, even though that sounds like a blast! ), I am an advocate of always bringing a hostess gift. Now you could bring some flowers, a scented candle or a bottle of champagne, and I know, it's the thought that counts. But when you get a gift you know the giver spent a little time conceiving, it most certainly makes all the difference. One way to inspire gift ideas is to hit the thrift stores, and as I've said before, the thrift gods never disappoint. When I was stumped on what to take a super-creative pal as he hosted a festive party in his home, I started making the rounds. I was rewarded by my last stop was at the Cure Thrift Shop , and was agog at the utter variety of high-quality wares on hand. Immediately, I became transfixed by a gorgeously merchandised dining table with a lovely Fire-King, two-quart casserole dish as its centerpiece. For more decorating dish, pick up a copy of The Find: The Housing Works Book of Decorating with Thrift Shop Treasures, Flea Market Objects, and Vintage Details at Borders, Barnes & Noble, Amazon or Powell's. Reuse & Repurpose: Take a Number -- And Some Curtains, Too! 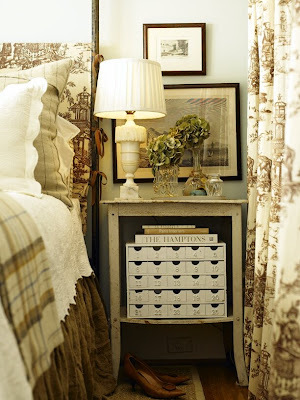 The Birmingham, Alabama, home Coastal Living's Heather Chadduck, is a prime example of delving into imaginative uses for what might have been cast off by someone else. For more on Heather's fabulous Birmingham home, pick up a copy of The Find, at at Borders, Barnes & Noble, Amazon or Powell's. The Elegant Thrifter -- Always Frugal, Always Fabulous! It's always about this time of year that I think back fondly to my jet-setting fashion days of traveling twice a year to Europe to witness the men's runway shows. These trips were the highlight of my career as a fashion director, and I loved all the glitz and glamour of seeing the star-studded catwalks, but also getting an inside peak at some of the most gorgeous spaces in both Florence and Milan. One of my favorite stops in Milan was the Moschino showroom on Via San Gregorio, a place where you could always expect the unexpected. On one trip, I took this photo of a picture frame created in the 1980s by the designer, Franco Moschino, when he was still alive. While I'm sure that this picture frame created out of fancy, Italian Persol sunglasses and costume masks didn't grow out of thrift finds, there's no reason it couldn't have. Every time I walk into a thrift store, I see tons of sunglasses for next to nothing. Why not pick up a whole bunch, paint them all one color and hot glue them to an inexpensive frame or mirror? You'd have a designer inspired show stopper guaranteed to get a second glance. 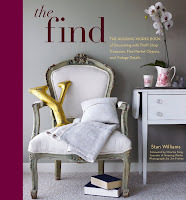 For more attention getting ideas for decorating your home with thrift and vintage, check out my book, The Find: The Housing Works Book of Decorating With Thrift Shop Treasures, Flea Market Objects, and Vintage Details at Borders, Barnes & Noble, Amazon or Powell's. For more of Vanessa's creations, pick up a copy of my book, The Find: The Housing Works Book of Decorating With Thrift Shop Treasures, Flea Market Objects, and Vintage Details at Borders, Barnes & Noble, Amazon or Powell's. I have to say I was blown away this morning by the amazing coverage that David Keeps of The LA Times gave me and my pal Ruth Handel for our frugal yet fabulous cocktail party that we threw back in February. I'm attaching the link, here, but be sure to click in the box with the forks in it to see the sidebar. If you can't figure it out, I've added the link to the sidebar here. Here's one of the highlights of Ruth's and my party: a "Hint 'O Mint" chocolate cake. It's a basic devil's food recipe, but I used a box mix for this one. I've made it from scratch, too, with pleasing results, but the showstopping addition for this special concoction is the buttercream frosting, which is super simple. (I say you can bake a cake from a box, but never use the canned icing!) Buttercream is nothing more than butter, some confectioners sugar and a drop of milk all beat up to a creamy sensation with an electric mixer. For this pale mint treat, I added a couple of drops of green food coloring a little bit of pure mint extract, and ringed the entire thing in York Peppermint Patties. I'm off for the weekend! Be back with you on Tuesday. The Gift of Thrift: Picture Perfect! You may have seen this story before, but I think it bears repeating, especially as we enter the festive season of summer celebrations. I am a firm believer in a hostess gift -- even if its an offering for a male host! Now we all have enough meaningful candles, and flowers are nice, but last just a couple of days. And then there's the delightful bottle of bubbly --love that too! But that precious nectar quickly disappears. For pennies on the dollar, you can give an easy, thoughtful gift that the receiver will love and keep forever! Last summer while touring the Istrian Coast of Croatia, I ran into a duo of tourist information panels that my Parisian travel pal Catherine Jouault and I thought were so funny that we had to capture them in photographs. The signs were at the entry to the Euphrasian Basilica in Porec alerting tourists as to what was forbidden within the church grounds: bikinis, copious cones of gelato, cigarette smoking, pointers or cocker spaniels and mobile phones. The graphics of the signs caught our attention – one in contemporary black and white and another in realistic pastel sketches. So when it came time for Catherine’s visit last fall, I wanted to offer her a memory of our wonderful time there, so I created this thrifty duo out of next to nothing. Reuse & Repurpose: Take Me Out! The warming spring weather has me thinking a lot about outdoor spaces, and living in a New York apartment without one must make me yearn for one even more. As we train our eye to find unexpected uses for thrift store finds, we often fall upon a piece that we might never think of to use beyond its intended purpose. I have to admit, this fine, leather example of a wing chair that I found at Housing Works last week doesn't naturally appeal to me. It's coloring suggests an Old English study and it's dimensions, for me in my small space, would overtake any corner of my room and draw too much attention. One of the things I learned from the amazing David Jimenez, whose 1906 Georgian Revival mansion is featured in my book The Find: The Housing Works Book of Decorating With Thrift Shop Treasures, Flea Market Objects, and Vintage Details, is that indoor furniture, when welcomed with an open eye and treated with a creative mind, can go right out doors, 365 days of the year. David told me the story of being attracted to an unmatched pair of winged chairs on one of his thrifting excursions, but with a few twists and turns, would suit his ultimate purpose. 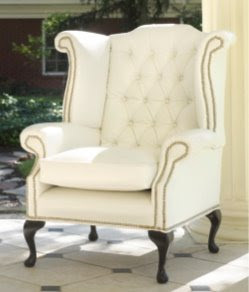 He unified them with white vinyl upholstery and added decorative nail heads -- and voilà! -- they lookabsolutely fresh and new. What's more, he put them out on his elegant portico, adding stately comfort and charm without worry. They are somewhat protected by the portico's roof, but any dust or grime is simply swiped away from the functional vinyl. For more of David's awe-inspiring work, visit his website: http://www.djjimenez.com. Or to see David's feature in The Find, pick up a copy at Borders, Barnes & Noble,Amazon or Powell's. Looking for a park bench -- not to buy -- but to lounge on! My task was to bring down the sizzle on what my pal Jonona Amor of Jonamor Decor called a "bacony" paint job that I applied to my papier mache volcano. It's just one of the dozon or more that I'm making for her and Senor's tablescape for their tiki inspired wedding celebration. She wisely suggested a burnt umber coat of acrylic paint sponged over all of the siennas I had originally applied. Eventually, these little masses will drip red glitter lava and spew red and orange flowers from their mouths. Back to the volcano factory in my dining room! The Elegant Thrifter -- Always Frugal, Always Fabulous!! Tonight I'm heading over to the brand spanking new Housing Works store at 130 Crosby street for a meet and mingle full of fabulous shopping! It's from 7 to 9, and will be a ton of fun. 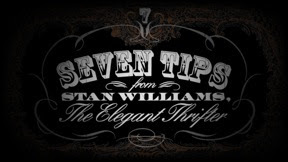 I made a video, which I'll be showing there, and will share 7 easy tips to thrift shopping. 7. Turn Clothing into Home Decor. Robert Elliott at elliottgdesign designed gorgeous slides and was the creative director on this project. And he'll be there, too! Come by tonight to pick up your own copy of The Find, or visit Borders, Barnes & Noble,Amazon or Powell's. The Object of My Desire: Thanks Heloise! March 9: "Tomato cocktail juice and consomme (instead of water), make a much more flavorful gravy for beef stew." John Derian is just another subject in The Find: The Housing Works Book of Decorating With Thrift Shop Treasures, Flea Market Finds, and Vintage Details, who so graciously allowed his home to be featured within his pages. I was thrilled and honored The Find nestled prominently on one of his signature, grain-sack upholstered sofas in a charming corner of his whimsical shop. Drop by the John Derian shop on East Second Street and buy a copy from him, or visit Borders, Barnes & Noble,Amazon or Powell's. Enjoying a calm Sunday -- The Elegant Thrifter, Always Frugal, Always Fabulous! The Gift of Thrift: Southern Style! I am blessed and honored to have been surrounded by so many creative people in my pursuit of The Find: The Housing Works Book of Decorating With Thrift Shop Treasures, Flea Market Objects, and Vintage Details. I could go on for days listing those who have shared their vision and supplied me with hours of wonder and amazement. Michael Quinn and Heather Kerr are two such rare gems of talent. Every production under their crafty and nimble watch is executed to perfection. How can you not see it in their demeanor when gazing upon this photograph by Jim Franco that was taken at their vintage tailgate party that's featured in The Find?! So when I called upon them to create the tabletops for a late-night supper hosted by Bevy Smith and The Hired Guns for a few close friends and out-of-town guests coming to celebrate Housing Works Design on a Dime, I knew their creations would astound with whimsy and wit. All they had to go on for a theme was that the buffet was Southern style, and they kept their plans under wrap until the day of the event. 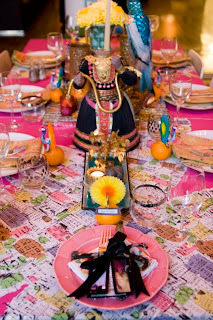 Basically using memorabilia, knickknacks, dishes and vessels they had in their possession, they carted everything out of their Brooklyn apartments into Manhattan and set up these jaw-dropping tablescapes. They latched on to the Southern theme and went global for each table: Southeast Asia, South Africa and South of the Border. And then there's a dessert station that tempts the taste buds and lures the eye. Michelle Talan took so many beautiful pictures that I could almost fill a chapter of a book with just Michael's and Heather's creations. I can't say enough about how much I love their creative spirit, and the frugal fun that they infuse into a party. I'll let a few of these pictures do the talking. 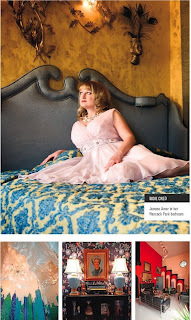 To see more of Heather's and Michael's work, buy a copy of The Find at Borders, Barnes & Noble,Amazon orPowell's. The Elegant Thrifter, Always Frugal, Always Fabulous! 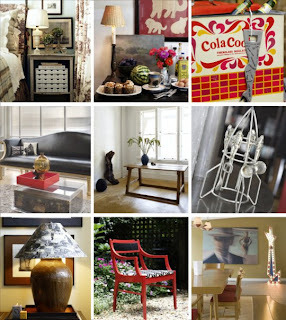 Reuse & Repurpose: Bring the Outdoors In, and Vice Versa! Yesterday while prepping a May 19 party at Housing Works new Crosby St. store for The Find: The Housing Works Book of Decorating With Thrift Shop Treasures, Flea Market Details, I ran across this metal planter that I couldn't keep from staring at. Now I have no room in my apartment for an addition of this size, but I love this metal structures sinewy arms and the mottled finish that it has developed with age and weather. Clearly, it would be happy indoors or out, and works just the way it is with all its age spots and blemishes, or could be brightened up with a fresh coat of paint. Come visit me at the brand-spanking new Housing Works Thrift Shop, 130 Crosby Street, just off Houston, Tuesday, May 19, at 7 pm. 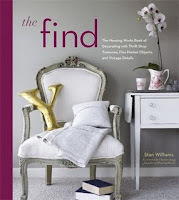 You can buy my book The Find: The Housing Works Book of Decorating With Thrift Shop Treasures, Flea Market Objects, and Vintage Details right there or order it at Borders, Barnes & Noble,Amazon orPowell's. I'd put out a windowbox, but the co-0p board would hate me! 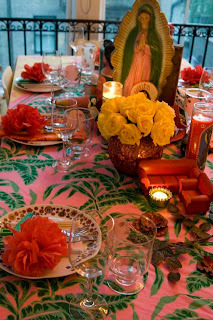 When my pal Jonona Amor, soon to marry Senor Amor, was talking to me about her wedding tabletop, she described to me a tiki-ish Polynesian themed event to take place in a man-made resort where fan dancing and wicked fun would rein. As we discussed what to do with her flowers, for some reason the vision of a volcano popped up in my head. "I'll make papier mâche volcanoes, and you can put red and orange flowers spewing out of the top." Maybe it was the morning caffeine talking or the jet lag between New York and LA, but no sooner than I said it, I was committed to creating these "lava-flower-spewing" constructions. I had never made a papier mâche volcano before, but before I knew it, I found myself cutting down plastic water bottles into 8-inch towers, dipping strips of newspaper in a watered down Elmers Glue solution, and draping them from the top of the bottle to the cardboard base. I used a hairdryer to set my form and then applied a coat of raw sienna acrylic paint, followed by stripes of burnt sienna. I once again looked to the hairdryer to speed up the setting process, which also caused the surface to contract and stretch, thereby creating natural looking crevices. So far, the results look good. Jonona liked the form, but thought my paint job looked "bacony." I can see what she means, so I'll sponge a coat of burnt umber on to bring it down. I'll show you how my project progresses. Check out the fabulous Amors of Jonamor Decor here. For more thrifty decorating and entertaining tips, pick up The Find: The Housing Works Book of Decorating With Thrift Shop Treasures, Flea Market Objects, and Vintage Details atBorders, Barnes & Noble,Amazon or Powell's. I've told the story about this wrought iron chair before, but it's a find that was literally sitting on a Brooklyn Street that my dear old pal Deb Kelt spied, rescued from the garbage and dragged several flights upstairs to her apartment. Sometimes, street finds need some extra TLC, such as a brisk scrubbing or a coat of paint, but this one, and its mate that she discovered at the same time, needed very little refurbishing except for a new seat covering that she crafted out of some fabric swatches she nabbed from the home furnishings publication where she and I once worked. You might notice that it's actually a garden chair and quite heavy. Oh, I've bumped my head on its weighty scrolled back several times, and you have to get into proper lifting mode to move it acros the room. (The best thing about it is that when you plop down in it, it never moves!) I've since put rubber casters on its feet, since it likes to scrape the floor, and my mother made me some green velvet seat covers to replace the old fabric that stained and tore on its journey to my Manhattan apartment. I've had these chairs around my dining table for almost 15 years and think about Deb, who packed it up and moved to Austin many years ago, every time I glance at them. So even on a rainy, spring day I have my indoor garden chair that always brightens my mood. For more tips on repurposing furniture, check out my book The Find: The Housing Works Book of Decorating With Thrift Shop Treasures, Flea Market Objects, and Vintage Details atBorders, Barnes & Noble,Amazon or Powell's. Dreaming of a cold lemonade -- The Elegant Thrifter, Always Frugal, Always Fabulous! One of the most influential periods in my life was spent studying at the University of Bordeaux in France. It was the farthest I had ever been away from my hometown of Independence, Missouri, and each day was an adventure, from learning the French language and figuring out the local bus system to being exposed to a lifestyle oceans away from the one I was accustomed to. Indochine, the French version of Depeche Mode. However, Arnold Turboust with his song Adelaïde has always held a special place in my musical repertoire. The summer I was leaving, I saw the video on French MTV of the curly-headed guy singing about being rebuffed by a pretty girl who was obsessed by a furry puppet, and could care less about him. I immediately went out and bought the 45rpm. Years pass and I'm searching all over iTunes for the song, but can only find the video. And one day on FaceBook, I see Arnold Turboust listed. Thinking I'm joining a fan page, I send a friend request, and get Arnold directly. We've become FaceBook friends and have even tried to meet in Paris, but our schedules (and phoning) just didn't seem to work out. holds inspiration that I glance at during the day while I'm at the computer. The 45rpm lives with a photo of a dear friend's twins taken a few years back and a program from the Kehinde Wiley exhibit I saw at the Studio Museum in Harlem. For more decorating inspiration, pick up my book, The Find: The Housing Works Book of Decorating With Thrift Shop Treasures, Flea Market Objects, and Vintage Details at Borders, Barnes & Noble,Amazon or Powell's. Je chante en français -- The Elegant Thrifter, Always Frugal, Always Fabulous! Sublime Sundays: My Sweet Mother! Here is a cute picture of my Mom with a creation she helped me make last year for a Dolly Parton themed party, Dolly-Rama. Now my childhood was not a poverty stricken as Dolly's, but Mom was always thrifty when it came to providing and used to make our clothes when we were small. For fun, she always had craft projects for us to do at home -- from pouring handmade candles to making glittery Christmas ornaments. In fact, when I had a preview for my book, The Find: The Housing Works Book of Decorating With Thrift Shop Treasures, Flea Market Objects and Vintage Details, she and Dad made a box of Rice Krispie Treats and sent it to the party. I love my mom very much. Always Frugal, Always Fabulous -- The Elegant Thrifter. My best gal pal Bevy Smith is one supportive woman on the town. Read here the nice chat up she gave me and my book, The Find: The Housing Works Book of Decorating With Thrift Shop Treasures, Flea Market Objects, and Vintage Details, in Paper. For your copy, go to Borders, Barnes & Noble,Amazon or Powell's. Always love being Bevy's guest -- The Elegant Thrifter -- Always Frugal, Always Fabulous! The Gift of Thrift: Don't Forget Your Mama! Now you don't have to be as naughty as Judy to please your dear, sweet mother. You can fill a vintage handbag full of candy, brownies, a gift certificate or even a shimmery piece of jewelry....sure to make your mama proud. Visit The Hooch Bag by The Elegant Thrifter here for a gaze at some of her old pals. Celebrate this season's hottest decorating trend! It's all about taking a creative eye and refashioning other people's cast-offs. I am so amazed by today's coverage in The New York Times home section featuring my book, The Find: The Housing Works Book of Decorating With Thrift Shop Treasures, Flea Market Objects, and Vintage Details. And they mention a mega-worthy event happening tonight, Design on a Dime, which Benefits Housing Works. Read the article here. Buy your copy of The Find at Borders, Barnes & Noble, Amazon and Powell's. I have admired this brown-lidded bean pot from my parents' home since I was a kid. I don't specifically eating beans prepared in it, but I do remember savoring one of my mom's specialties, from it, bubbling to perfection: green rice casserole, one of those '70s dishes that involves mixing white rice with frozen broccoli, adding a can or two of Campbell's cream of mushroom soup, and then topping it off with a handful or two of crushed Saltine crackers. A few years back I admired the pot that had been retired to an upper kitchen cabinet and told her that if she ever wanted to get rid of it, I wanted it. Well, she sent it to me, and when I turned it over I read in black market, "Wedding Present, July 1 1962." That was the year my mom and dad got married in Mansfield, Missouri. I sneak my treasured bean pot into any scenario I can. It has made appearances at theme parties: a Dolly-Parton celebration where it held her own recipe of Cowboy Baked beans and a festive indoor tailgate party that appeared in my book The Find: The Housing Works Book of Decorating With Thrift Shop Treasures, Flea Market Obects, and Vintage Details. My dear object will reappear tomorrow night when dear friends put together a late-night Sunday supper (on a Thursday!) celebrating my books launch. Even though my dear mom and dad can't be there, their old bean pot will! "Beans, beans good for the heart!" My decorating pals Senor and Jonona Amor, principals of Jonamor Decor ,are getting lots of attention these days. Not only are they showcased in The Find: The Housing Works Book of Decorating With Thrift Shop Treasures, Flea Market Objects, and Vintage Details, but they're also featured big time on page 36 of the latest issue of Angeleno Interiors. I love the photo at left of Jonona dreamily peering out her bedroom window, and the photo (bottom left) of former Go-Go Jane Wiedlin's Gaudi-esque bathroom. In The Find, you'll get a private tour of two of their out-of-the-box design projects: their own LA pad, filled with delight and whimsy, and Wiedlin's intergalactic downtown loft. These lovebirds are true talents. And I credit Jonona for coining one of my favorite new decorating terms: Success-orize! And be sure to purchase your ticket to Design on a Dime for May 7, benefitting Housing Works, New York's premiere thrift store where all proceeds go to battle the double epidemic of HIV/AIDS and homelessness. Click here to buy tickets. 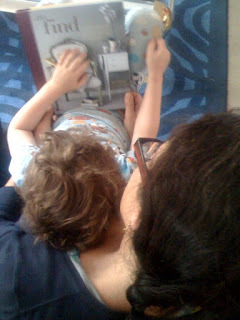 Once again, I divert, but truly, this is one of the most satisfying and heart-warming photos I've seen in a long time: a dear friend with her son perusing the pages of The Find: The Housing Works Book of Decorating With Thrift Shop Treasures, Flea Market Objects, and Vintage Details. She sent me this photo this morning, having just received her book, and it truly made my day. I hope you enjoy your copy of The Find, which hits bookshelves tomorrow. 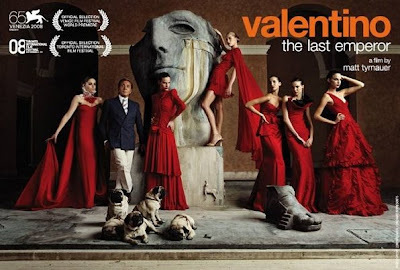 Perfect for a rainy, gray Sunday afternoon -- 45 years of Valentino, the fashion legend! I hear that copies of my book, The Find: The Housing Works Book of Decorating With Thrift Shop Treasures, Flea Market Objects, and Vintage Details has started shipping from Amazon today for its on-shelf date of May 5! For those of you awaiting your book, you can get a preview today by joining its fan page on Facebook. Just to tempt you, here's a shot of the index page with pictures from my book. Buy your copy at Borders, Barnes & Noble, Amazon and Powell's. The Gift of Thrift: Use Your Best Every Day! Who says you can’t drink out of crystal and eat with silver forks and spoons everyday. If you shop in a thrift shop for your dinnerware, then you absolutely can, and should. I’m more careful with crystal glasses, since they can easily be nicked and damaged in the dishwasher. Also, the high temperatures can cause them to crack, just like my old china that I have banned from the dishwasher. But that doesn’t keep me from using them whenever I like. In fact, using my best every day seems to make everything just taste a little better! A toast to you from The Elegant Thrifter, Always Frugal, Always Fabulous! For more entertaining ideas, pick up The Find: The Housing Works Book of Decorating With Thrift Shop Treasures, Flea Market Objects, and Vintage Details at Borders, Barnes & Noble, Amazon and Powell's.